This PDF 1.5 document has been generated by Microsoft® Word 2010, and has been sent on pdf-archive.com on 17/08/2015 at 11:30, from IP address 73.35.x.x. The current document download page has been viewed 401 times. 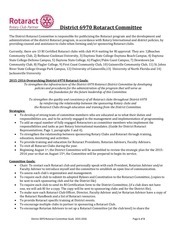 District 6970 Rotaract Chair atkellysastre@aol.com, for questions, contact Mrs. Altosino-Sastre at 305-710-6652. Use as many pages as needed to fully answer the questions. 3. Where is the organization based? 3. Why have you selected this international project? 4. Have you identified a Rotary*/Rotaract club in the county/city where the project will take place? 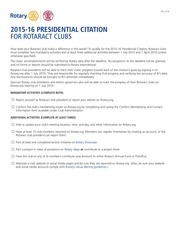 If yes, list: Name of Club, District, Club President, contact information. 4. What is your mission and vision for the project? a) Who will you invite to participate/partner with your Rotaract Club on this project? b) Do you personally have the time to see this project through to the end? addresses and titles as project leader. d) What is your time line for the project from start to finish? 5. Please explain the full scope of this project. 8. Has this project been approved by your college? What process did you go through to get approval? 9. 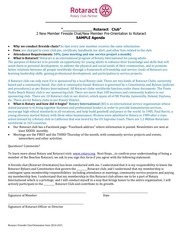 Has this project been approved by your sponsoring Rotary Club? 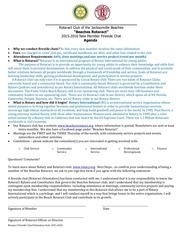 How will the Rotary club participate? 10. What application/agreement/commitment etc. 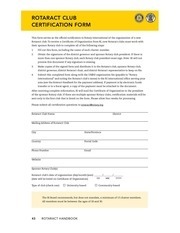 is required by the partnering organization? submitted it will be send to the District Governor for final approval. This file has been shared by a user of PDF Archive. Document ID: 00296070.